Both sexes have markings that resemble huge pale goggles, or spectacles, around their eyes. 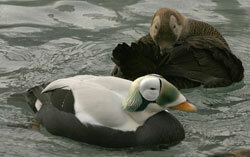 The spectacled eider (Somateria fischeri) breeds on Arctic tundra in Western Alaska on the Yukon-Kuskokwim Delta, along the northern Alaskan coast from Wainwright eastward to Camden Bay, and around several deltas in Siberia. These sea ducks molt in shallow waters near the shore then congregate in the Bering Sea south of St. Lawrence Island for winter, often on pack ice with openings, over waters as deep as 200 feet. Colville River Delta (Arctic North Slope): They can be found here in early to mid June after the ice thaws. Barrow: A good place to find them is at Fresh Water Lake from early to mid June. Nome: They are rare but have been spotted near the port in spring and off Nome harbor or around Cape Nome in August and September. Gambell, St Lawrence Island: Some years they are relatively easy to see at “The Point” in spring, but other years they are quite rare. They have been reported flying past in substantial numbers during late October and early November.